petition: Time for a National Monorail system. The Internet for Transportation. Time for a National Monorail system. The Internet for Transportation. The energy grid, transportation, and communication grid can all be solved; in a single shot. Time to build a Internet for transportation! A TransNet! It would cut the cost of transportation to fractions current levels, both for industry and the individual (could be free to the public for use at current road maintenance tax levels), which would ensure future economic wealth and foreign corporate investment. It would expand the radius a individual can commute for work (and you can surf the net on the way! ), which would increase the individuals capacity at finding jobs within their field and skill set. It would end the need of disposable cars, which would be a boon for sustainable resource existence, and open up our energies to be focused towards continued growth, such as space industry, and the never ending project of feeding and providing habitat and increasing standards of living for billions of humans while decreasing their footprint within the biosphere. (but would provide almost unlimited jobs in the short term to provide a bridge from yesterdays industrial age to the next) It would have a life span well over twice as long as current highway systems, cutting the cost of info-structure maintenance to fractions of current levels. The benefits are countless. Yes there are some negatives such as the impact on pre-existing industries (trucking, air travel, traffic officers, etc.) but those would be long term effects completely counter-balanced by the job creation of the construction process and the economic rewards (short and long term .. and the postive impact of such a drastic decrease in the cost of the transportation of goods really can not be emphasized enough, both in commerice and industry), business and job creation that a next generation transportation grid would create. The Transnet is a bridge between yesterday and tomorrow. Between reckless growth, and sustainable prosperity. But again, the project is larger then anything corporations can do independently, thus government would need to employ corporations to the task. Sure it would cost us money i the short term, but that is stimulus money (ie. it provides jobs, and feeds the money right back into the GDP), and would save our children many times what it costs in the long term. The cost of construction can be offset with modern technologies. The concrete T-rails can be mass produced in forms, and then transported on the already constructed sections. And a new generation of tunnel bores, that after the initial investment to build would greatly cut the cost of future expansion of the system by automating a lot of the process. but the scale of rebuilding a national transportation system would still provide as many jobs as people that want to work. Some but not all Monorail systems are Maglev. I would greatly favor a Maglev system, but that is something that could be determined in the design process. I believe Maglev makes for the greatest ride comfort, energy efficiency, design flexibility and safety. I am the first that I know of to propose a Pod form of monorail-maglev system. (local and long distance trunks, where the pods speed up to form into trains for less drag and greater speeds) I feel we need a much more flexible system then current and past designs, in order to completely revolutionize transportation. We need to take the lead again. Energy: An Electric car is approximately 6 times more energy efficient then a combustion car. A Maglev system would be more efficient still. (no road drag among other things) The entire system would consume fractions of the energy our current transportation requires. Transferring our energy demands to our energy grid reduces the power of the Oil lobbyist making it easier to switch our energy consumption completely to renewable sources such as EGS Geothermal. Power plants are much more efficient at producing electricity per unit of fossil fuel then combustion cars. So you have decreased pollution from decreased energy consumption. Power plants also pollute much less then combustion vehicles per unit of fuel consumed. So even running on fossil energy, the Transnet would produce far less pollution then our highway system. Currently one of the major obstacles to renewable energy sources is our power grid. Our current energy grid wastes almost half the energy put into it, and is not flexible enough to cope with a large quantity of dynamic alternative energy sources. Rebuilding the grid would cost about 280 billion dollars. (while our highway systems needs about 2 trillion to get back up to code) But because the Transnet is ALSO our power grid there would be a great deal of savings by merging our Transportation and Energy info-structures and longer lasting more stable and efficient system. It could also carry our communication grid, either through the power lines or separate but more accessible lines that would be much easier to run. And of course there is the already mentioned savings from having to matain a smaller road system, to say nothing for the 700 billion a year we are spending for oil. Projected impact upon the auto-industry: really the project should help more then harm this industry. As it will take time to create a Transnet with full national coverage, there will still be a demand for cars. The decreased demand would be counter balanced by contracts for the construction of the Transnet pods and automated assembly machinery such as a new generation of tunnel bores. And the cash infusion of those contracts would enable our auto-industries to retool into a more flexible industry (just like they did in WW2 for the war effort), for wider array of more efficient and inexpensive electric cars for the growing global market. 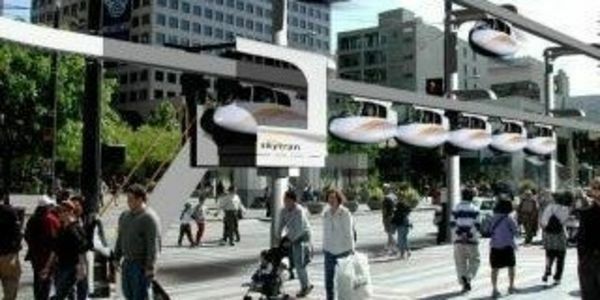 And many nations will look at our transportation grid, and become customers for the Transnet pods as well. ps. sorry I'll fix&refine the text a little better later. remember: it costs money to save money! The industrial age is over in the United States with a vacuum in it's place. This is the time to put our nation back to work while opening the doorway to future industry! is 20,000 signatures unrealistic? yes. but that is the odds against us. Truth is that other nations will likely build this before the USA. Our GDP is twice that of the next nation in line, but.. we've lost the spark. So I listed what we need not what were likely to get.